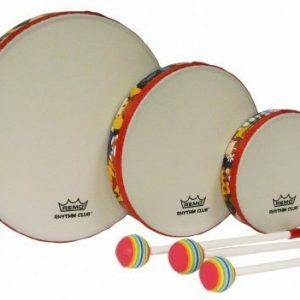 Sound shapes are pre-tuned hand drums that arent much bigger than a normal drumhead by itself. 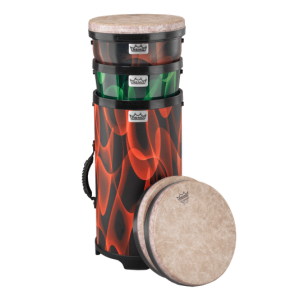 Theyre mounted in Remos Acousticon® shell material, but these fun little creations come in a variety of shapes and colors! 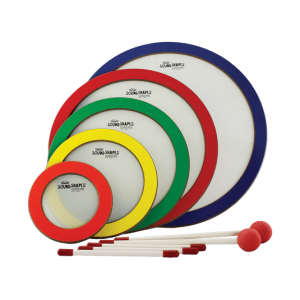 All of these fun shapes and colors add up to all kinds of fun and flexibility for groups of any size whether in class or drum circles. Because Sound Shapes are light, affordable, and incredibly portable, they add a new dimension to who can play and in larger groups. 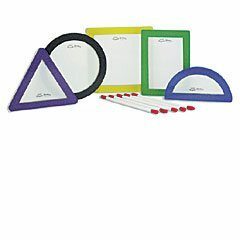 This package includes the following Sound Shapes: 9″ Circle, Triangle, Rectangle, Square, Half-Circle, Multi Color, along with playing sticks.